Harewood Castle is a mid 14th century stone rectangular two storey tower house, founded by Sir William de Aldeburgh. Standing on a steep slope overlooking the Wharfe Valley, the site has been occupied since the 12th century. Granted a Royal licence to crenellate the dwelling-place of his manor of Harewode by King Edward III in 1366, the great hall with solar above, is flanked by four storey angle towers. The plain entrance tower is crowned by a chapel, above the portcullis chamber and the lower kitchen wing with a barrel-vaulted basement that contains the well, is of three storeys. Edward Balliol, King of Scotland, is reputed to have taken refuge here and later it was the home of the Redmaynes and the Rythers. Successor to Rougemont Castle, the castle was habitable in 1630 but ruinous when was sold to Sir John Cutler in 1656. 6 miles north-east is Spofforth Castle. 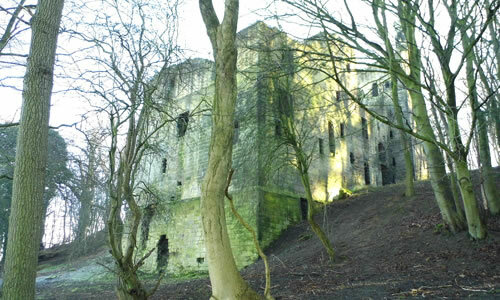 Harewood Castle is located in the park of Harewood House, off Harewood Gate. 9 miles north of Leeds, on the A61. The outside of the site is freely accessible in daylight hours, with guided tours, April to October.